Did Ants Kill a Tree? Q. Angela "way up in Northern High Level, Alberta" writes: "I love to listen to your show on podcast! I've got a problem with ants killing my trees. We decided to get rid of a row of poplar trees; half of them were dead already and we wanted to replace them with something else. As we pulled them out we saw that most of their roots were infested with ants. Now I'm wondering how to prevent my other trees (still standing) from dying of ants like the others did? Most of the ants were underground in the roots, so we didn't even know they were there!" A. I can generally earn a passing grade in horticulture, despite never having taken a botany class. (Eerily, I have taught a few as a guest instructor, but I always stuck to plants that I have personally grown.) Entomology is another story. I read every book and article on insects I can get my hands on and am always eager to upgrade that knowledge. I read a lot about ants, and when I first got this email, I had three thoughts. 1) she saw termites, not ants. 3) there's a species of ant I haven't yet encountered in my thirty years on this beat. So I emailed Angela back to ask "are you sure you didn't see a termite colony?" Her response: "I'm pretty confident they were ants! As we were cutting up the trees I saw a big increase of ants in my garden a little ways off. But I also recently read that Poplar trees can rot and die from the inside before any problems are visible on the outside--so maybe that's what attracted the ants?" Bingo, Angie—take a prize from the top shelf, as you did find your answer. 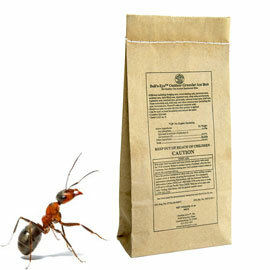 Ants and termites are about equal in their dominance of this planet. The exact numbers are impossible to determine, but there are more ants and termites than there are anything else. Both live in large colonies and depend on a queen to keep the enterprise moving along. There are a surprisingly limited number of different species of termites, but many thousands of different species of ants, from annoying leafcutters to deadly fire ants to the wonderfully named 'raspberry crazy ant'. In general, ants are wonderful creatures to have around farms and gardens. They eat weed seeds, aerate the soil and keep termites away. Speaking of termites, let's get them out of the way. I initially focused on these creatures because termites will eat 'sound' wood—living trees, lumber that has no rot or dampness, piles of newspaper and cardboard, etc. But Angie lives in an area that gets so cold that they ain't got no termites. Temps in High Level—that's the actual name of her town—have dipped as low as minus 60 degrees F. The warmer your climate, the more termite species you'll have to contend with and the more destructive they tend to be. Angie lives in one of the few places on the planet without any. Although the ants themselves are not the problem when this occurs; as Shakespeare once coined, "the fault, dear Brutus is not in our ants, but in our wood". Carpenter ants will not chew into good wood. In a home, their presence is a sure sign of dry rot or moisture damage. Rather than attack the ants, you should thank them for pointing out a problem that would only get worse. Replace the bad wood and the workers will wander off to another job site. In trees, carpenter ants are generally a sign that the tree is dead or dying. The big exception would be a healthy tree with some branches that were damaged by wind, ice, snow or Evil Squirrels. Carpenter ants would be attracted to this wood as it rots, making it more prone to unexpectedly dropping onto your pumpkin head. That's why the advice is to always remove dead branches as soon as they appear. If carpenter ants are in the roots of a tree, those roots are soft and rotten, probably from poor drainage. Keep this in mind when you install replacements; position the trees at the highest points in your property, make sure the root flares are visible above ground, keep any mulch four to six inches away from the trunk, and don't let the mulch exceed two inches in height. Web only: And here's a great article about Carpenter ants in Canada.